Got a question for Johnny Marr? Tell us and win some D'Addario strings! 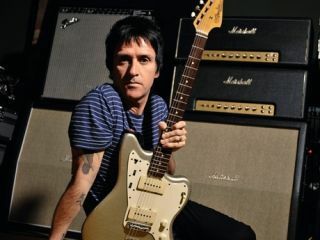 TG is interviewing indie guitar legend Johnny Marr next week and we're giving you the chance to ask him your questions. If you've got something you want to ask the man who is regarded the world over as the ultimate indie guitarist, just get in touch via the Total Guitar Twitter or Facebook pages or by emailing totalguitar@futurenet.com with the subject line 'Question for Johnny Marr' and your name, location and question. What can we say? First it was Tom Morello, now Johnny Marr. We've just about got legendary guitarists coming out of our ears here on TG. This is your chance to ask Marr about the things that you want to know, but have never seen elsewhere. Maybe you want to get technical and find out the specs of his forthcoming signature Fender Jaguar, perhaps you want to know how he came with the riff from a Smiths' tune, or what about his time as a journeyman guitarist with Modest Mouse, The Cribs, or his own band The Healers? Get in touch and let us know! Finally, remember we're a guitar mag, so although we may slip in a few general ones, if you ask a question about Johnny's guitar playing or songwriting, you're much more likely to get it answered. If we pick your question, you'll win a set of D'Adarrio guitar strings and feature in a forthcoming issue of Total Guitar.